Caden, whose elder brothers have all gone on quests, is sent abruptly on one by his father, King Axel of Razzon. When he finds a dragon terrorizing a village, he is prepared to slay it, but is caught up with Brynne, a spellcaster whom he knows slightly, and is catapulted into Asheville, North Carolina! So much for achieving the status of Elite Paladin! Luckily, his gift is the gift of languages, so he is able to communicate, and Brynne's magic is helpful as well. After several days camping in the park with Caden's snow stallion, Sir Horace, the group is found by policemen. Caden tells them the truth about what he is doing in the park, and almost ends up under psychiatric care. Instead, he is sent to foster care with Rosa, and Brynne and Sir Horace escape. It's hard to transition from being a prince to being in foster care, but befriending Tito helps. What doesn't help is the fact that another foster child, Jane Chan, has gone missing, and the teachers at Caden's new school seem suspicious. The worst of the group is his math teacher, Mr. Rathis, who looks alarmingly like Rath Dunn, tyrant of the Greater Realm. He reveals himself to Caden, and Caden suspects he had something to do with Jane's disappearance. Ms. Primrose is also very odd, and Caden learns that she is really the one in charge of all of the teachers, all of whom have very dangerous ties to Razzon. Caden's quest was to slay a dragon, and he manages to find dragons to fight right in Asheville! This was not quite the book I expected it to be, which was a very good thing. I was expecting something like Thomson's Dark Lord: The Early Years, and thought that Caden would bumble along in Asheville, make some friends, solve a mystery, and then go back to Razzon. Instead, I liked how Asheville was the "Land of Shadows" and Caden's school was housing villains from his kingdom! This gave the book a Harry Potter feeling without having any other elements of that book. The idea of a magical kingdom seeping into our world, instead of characters from our world going right into a magical kingdom, is a fresh one. Caden manages to hold true to who he is while combating forces beyond his comprehension, but he isn't inflexible. He makes friends with Tito, and accepts that he has to be in a special education class because while he can speak many languages, he can't necessarily read them. His growing friendship with Brynne has a nice mixture of annoyance, especially when she blends in to their new setting better than he does. My favorite line was this one from Brynne (page 196) "The tech is the magic of Asheville, and I'm good at magic." This book will appeal to a wide range of fantasy readers who enjoy everything from Cornelia Funke to Rick Riordan to Jane Yolen. There's a touch of the medieval world mixed with the realities of foster care, so Caden has to wrestle with jeans that are too long as well as savage Elderdragons! And since he is not sent back to Razzon at the end of the book, we can only hope that there will be a sequel! It's really irritating that some books receive huge amounts of publicity and aren't really that good, while well-crafted books like this don't even make my radar unless the author contacts me personally! I have to say that I was prepared to HATE the following book. Dealing with grief? Not another one. (Eyes roll entirely back into head.) I was not a fan of Absolutely Almost, mostly because of the nanny (although apparently people have them on the East coast), and A Tangle of Knots was just...weird. The print was smaller than my students like. And, ugh, right there on the cover, it says "Author of the National Book Award Nominee". Trent is known is Cedar Lake as that kid... the kid who threw the hockey puck that killed Justin Richards. Not on purpose, but with an accidental blow that stopped his defective heart. Now, Trent is afraid to play baseball, afraid to participate in gym, alienated from his friends, and mad at his father. His father is a different issue, although Trent thinks his father only cares about himself after his comment to Trent after the accident is "Well, it happened, I guess. And there's nothing you can do about it now. No use thinking about it." (page 89. I want to have this embroidered on a pillow. The world would be a much better place if people embraced this philosophy.) He lives an hour away, but meets with Trent and his brothers Doug and Aaron for dinner, even though his new wife, Kari, is pregnant. Trent's mother is supportive, having him help at her kitchen store, checking up on him, making him get counseling in the wake of the accident. Trent even manages to make a new friend, Fallon, who is a bit Stargirl-quirky but fun to be around. Trent has supportive teachers, from Mr. Gorman in gym who doesn't make him participate but gives him other options, to the "wrinkled old crone" Ms. Emerson, who lets Trent water her plants every day and just is there for him. Still, Trent can't pull it together. He is appalled that his brother Doug is friends with Justin's sister Annie. He manages to purposefully get a B- in every class. He's angry with his mother, won't see his father at all, and even beats up a boy who is taunting Fallon. This is a mistake, because it makes Fallon afraid of him. Accidentally killing someone with a hockey puck is one thing; it makes Trent afraid of himself. But for Fallon to be afraid of him is unbearable. Gently guided by the adults around him, Trent knows what he needs to do to regain her trust. He visits her father and offers to "water the plants" so that he trusts Trent. He tries to mend things with his mother, even seeking out her new boyfriend to help him with his baseball. And in a truly inspired literary moment, he sees how much his older brother, Aaron, is trying to help everyone around him, even though he is himself in danger of failing a class. All of these influences help Trent to get over his anger and frustration and begin to move on with his life. The book is gently humorous, and has a lot of appealing scenes that move the plot forward at a good clip. Trent's obsession with baseball will attract a lot of readers to the story, if only for the list of baseball movies that he and Fallon watch. The conflict with his father is one that will resonate with middle grade readers, since issues with parents are part and parcel of middle school. Fans of Palacio's Wonder, Buyea's Because of Mr. Terupt , Bauer's Almost Home and Jordan Sonnenblick's humorous but introspective work will feel Trent's frustration and breath a sigh of relief when he finally is able to look up and relocate everything he has Lost in the Sun. Blather: Entering week three of four in orthopedic boot. On the bright side, the problem the boot is solving is insignificant. Achilles tendonitis caused by overuse. When your doctor laughs when you say "But I HAVE been taking it easier!" and points out that you biked five miles to get to the office, it's a sure sign that you've just been overdoing. No long term problems, nothing serious at all. So far, I've convinced people the injury was caused by sky diving, mountain climbing, participating in the X Games, the Tour de France and kickboxing. Much more fun to say "Mixed martial arts really IS a sport for the young" than to admit that your injury is caused by being fifty, running three miles a day, and having poor genetics. I can drive, but my daughter got a job across town and has my car, so I get to sit at home and read all day! Might have to beg a ride to school to place a book order, but I think my principal will understand if I don't make it in. Members of staff have to swim out to the garden to tie up tomatoes for me, and doing laundry is a full day's work. Other people have to carry things up and down the stairs for me! Trying to look at this as a protracted vacation! So why am I so grumpy today? That boot looks so uncomfortable, but only one more week (Well it happened, no use thinking about it!). I just finished LOST IN THE SUN and hope to have a review up soon. Very realistic. I haven't read your fantasy selection but have added it to my list. Oh no! At least you can have fun with telling people stories about how you injured your foot. I hope the boot comes off on schedule and you are back on your feet soon. Meanwhile, enjoy the reading vacation. 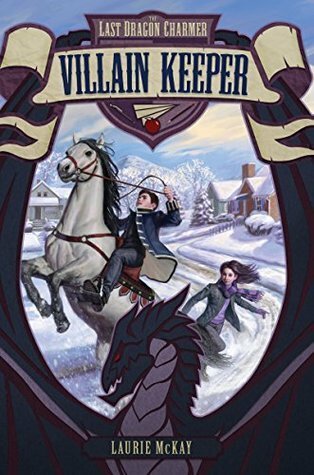 Thanks for sharing about The Villain Keeper. It sounds like a good one. I love the Asheville area, so that is an added bonus. I've heard good things about The Villain Keeper elsewhere. I really like how he plays with the fantasy motifs. It sounds like a lot of fun. I haven't read any of Graff's work yet, but this sounds interesting. I did get to hear her speak at a conference a few years back and was really impressed. So sorry to hear about your enforced vacation--at least it's only one more week! Way to look on the bright side of stuck in a boot. Enjoy your reading time. I have a copy of Lost in the Sun and am hoping to find time to read it soon. Your review really makes me want to get to it. Thanks for the post. My daughter-in-law is wearing a boot for the same thing, but it's running that got to her. She's younger, but has been wearing for longer. I am hopeful for you both! Thanks for the Villain Keeper. I enjoyed your review, might never have known about it without your sharing. Lost In The Sun has been praised a bunch. I'll get to it some day I'm sure. Thanks, Karen, & best wishes! It sounds to me like you should be writing all these stories about your injury down. I'm so sorry about it though. I am now so stoked about The Villain Keeper! I want a copy now to read. I've got Lost in the Sun on my list, although like you, I wasn't infatuated with Absolutely Almost. Good Luck! Ugh. The boot. I've been there, so I feel your pain! Hopefully you don't have too much longer. Thank you for sharing the Villain Keeper--I didn't know that one. I don't think people give tendonitis enough credit. They perceive a broken bone as worse, but tendonitis is very, very painful! I feel for you, my friend. I'm sending warm thoughts your way. My dad gets his cast off (many broken bones in his leg) this week, and he gets a boot. So you will have a boot buddy! Asheville is only 120 miles away from Charlotte--any chance Caden could show up here? Or at least a dragon? Ohmigosh! I hope you get well soon! :-( But on the other hand, the book sounds really intriguing, and the cover is just plain awesome. Thanks for the review and I hope you get better! Hope the grumpiness has eased up somewhat. :( It's good to ahve time to stay at home and read though. 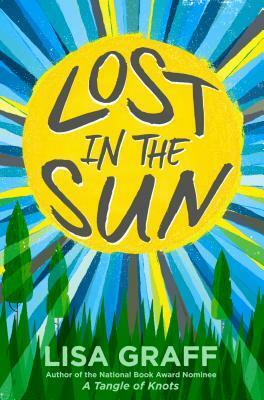 Lost in the Sun sounds like a special book - I've read so many lovely reviews about it, will definitely look for this one.